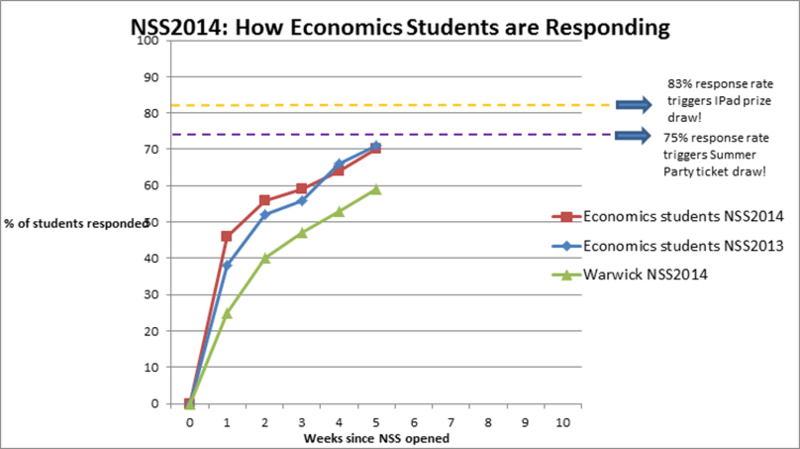 Since the NSS opened, 71% of students based in Economics have now responded. This compares to 70% as of this time last year, and 59% for Warwick as a whole. So, we are really pleased with the level of engagement you've shown, and we hope for even more so we can start to award our great prizes. Economics students are in the top 8 departments for response rates across the University also. If we reach a 75% response rate, which is only 14 more students filling in the Survey, there will be a prize draw of 8 Summer Party tickets. An 83% response rate will trigger a further prize draw for 4 iPads.